If you’re an employer, it’s likely that you have a legal obligation to provide a safe and productive work environment for employees and those who will come in contact with your organization (i.e. your customers). Simply put, employers are often liable for harm their employees inflict on others. According to the Negligent Hiring Doctrine, employers have a duty of care to assess the nature of the employment, its degree of risk to third parties, and then perform a reasonable background investigation to ensure that the applicant is competent and fit for duty. In fact, the risk associated with negligent hiring may be the single most important force driving employers’ use of employment criminal background checks and employment background screening services in general. And considering employers lose about 70% of negligent hiring claims, with damages averaging $1 million per case, it is wise for employers to take appropriate measures. An employee causes harm to a fellow employee or third party. The employee had a prior reputation or record that showed a propensity toward such behavior. The employer knew or could have known about the employee’s past record by performing a reasonable investigation. Duty of Care from an employer’s standpoint is a requirement to act toward employees and the public with reasonable watchfulness, attention, caution, and prudence as dictated by the circumstances. If an employer’s actions do not meet this standard of care, then the acts could be considered negligent, and any damages resulting may be claimed in a lawsuit for negligence. 1. Does the employer in fact owe a duty of care? In other words, did the employer know or should the employer have known that the employee would have contact with the person who was harmed? 2. How much care does the employer owe? Employers are expected to take reasonable care, not to be superheroes. The degree of care an employer must take depends greatly upon the nature of the employee’s job and the severity of the risk to third parties. Generally speaking, the more unsupervised access to people and/or property, the greater the risk. Employment criminal background checks are widely accepted as one of the tools used by employers to demonstrate a “duty of care” in their employment decisions. Forseeability is defined as the reasonable anticipation of the possible results of an action, such as what may happen if one is negligent. In the case of negligent hiring, courts will generally look at whether an employer knew or should have known that the employee was likely to cause harm. An interesting statute in the state of Florida (Florida Statute 768.096) lends credibility to the idea that background checks can protect employers against negligent hiring. The Florida statute gives employers the benefit of the doubt in negligent hiring suits, presuming they are NOT negligent if, before hiring the employee, the employer conducted a background investigation of the prospective employee and the investigation did not reveal information that reasonably demonstrated that the individual was unsuitable for the particular work or employment in general. Texas has a similar statute that further boosts the role of background screening. By following a best practice background screening process, including the use of criminal background checks, employers can decrease their risks while creating a safer and more productive workforce. 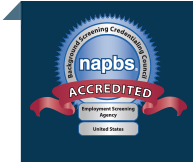 To learn more, explore our employment background screening services.